From a commentator: "I wonder, is there a way to get AdSense to display more graphic ads? I think those are MUCH more likely to be clicked." Let's leave aside of whether graphic or text AdSense ads converts better and just concentrate on how to get graphic AdSense ads. Well, if you are convinced that image ads convert better than text ads, all you need to do is to select Image ads only rather than the text ads only. My own preference is for contextual text ads as I feel that text ads are less obtrusive than graphic ads which I feel are more jarring. However, my choice of the 3 options is to select the default - text and image ads as I trust Google's ad algorithm can select the best option for the situation. The advice for best result for your ads is to put it above the fold (the part of your page which is first seen by visitors without having to scroll down vertically. So some will have the impression that putting a leaderboard ad unit in the footer of a page is a bad idea as it is very much less visible, and the chances of the ads there being clicked on is very low. That is true. But from examination of my earning reports, CPM ads (cost per 1000 impressions) (click BACK button to get back to this page) are frequently displayed in the leaderboard ad unit in the footer. And even when there is no click on the ad, I get earning for the impression. I didn't expect much clicks from the leaderboard in the footer because it is below the fold and less visible unless the visitor happens to be in an individual post page which is a short post. However, I see from my reports, there are still clicks on ads in leaderboard ad units in the footer. So why waste that opportunity? Put a leaderboard ad unit in the footer and earn from CPM ads and sometimes get some clicks too. 3. There will be 3 choices, AdSense for Content, AdSense for Search and Referrals. 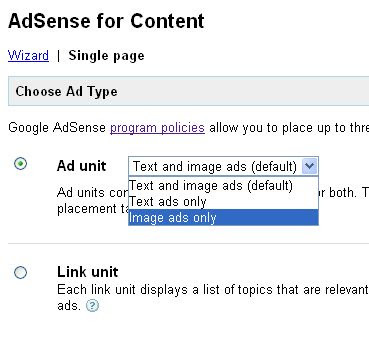 Click AdSense for Content. 4. 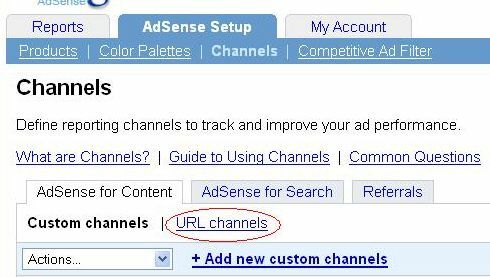 Under the AdSense Setup tab, click "Channel"
6. Click "Add new URL channels"
8. Then click "Add channels" and you are done. This question often crops up in forums, so I will answer that here in a post. If you have a query regarding AdSense you can use their contact form at AdSense Help Center. If you have accidentally clicked on ads on your own site, it is better to inform AdSense about it before they find out and perhaps ban you from AdSense. Or you may have installed AdSense click tracking program and have noticed suspicious activities. The contact form to inform AdSense about it is Invalid click contact.